TBC continues to assist a total of 1,601 pupils in Eastern Equatoria State (EES), South Sudan. These pupils are in schools run by Evangelical Church of South Sudan (ECSS). Because of this year's drought and crop failure, there is hunger and children are starving. The pupils will be having hot meals of a cup of porridge or beans even during and after the Christmas holidays. The head teachers anticipated that the upcoming academic year 2010-2011, starting the last week of February that the total number of pupils will extremely increase. It may become necessary to place a limit on the number of students in order to provide better education and reduce the class size. The hot meals significantly boosted school attendance. We give glory to Him. In order for the hot meals to continue to be available for school going children, TBC funding source is very crucial. ECSS is embarking on TBC to raise funds for this important feeding program. We count on TBC support. ECSS faces problems of the increasing food prices in local market and it has greatly impacted on feeding activities as well as Evangelism. ECSS evangelism activities are not well resourced, resulting in the pastors and their families facing horrible challenges. They are unsupported. Here are some pictures of the feeding program. Through your faithful support, Trinity has been able to help subsidize this project, and in doing so provide a hot meal to the children in the area. Dear friends, thank you very much for helping to feed hungry children in South Sudan and encouraging them to attend school, improve their academic performance and have a brighter future. This month or October 2009, The Evangelical Church of South Sudan (ECSS), in partnership with Christian friends in USA, has been providing daily lunch to over 1000 pre-school, kindergarten and primary school children in four schools in Eastern Equatoria State (EES), Southern Sudan. The objectives of this kind of feeding are to help starving children because of crop failures caused by drought this year in Sudan, to help the children's nutrition (malnutrition is killing childre) and to increase attendance, reduce dropout rates and improve overall academic performance, especially among girls. This year in Sudan (and most probably also next year 2010) hunger and maln utrition continue to be a national pandemic affecting thousands of Sudanese population, particularly children. For teachers, school feeding gives them more gravitas. "Sometimes parents find it hard to understand why schooling is important for their children as it doesn't provide any immediate benefit to their lives," says Joseph. "Now at least they know that their children will be fed even if they didn't catch a fish that day." "We come to school for the food," said Joyce Avelino a young girl in Torit town, "and we also get to learn too" she continued. One of our school head teachers, Barnabas Oller Anthony described school feeding as being "to attract poor and hungry children to school and ensure that they get the food, educat ion, health and other basic services they need to thrive. Food for Education can bring children into school and out of hunger," he told us. In fact starvation rates in children seem to correspond to school attendance rates, Jenthy Amal says. We have no doubt those Sudanese families who can't get food are less likely to send their children to school. Surprisingly, these two weeks the number of school going children in ECSS elementary schools has tremendously increased! Please Continue to Help! Help us to feed vulnerable school children in South. You may send your contributions immediately to the address in the contact information section of ECSS blog. It is sent to WorldVenture in Littleton CO and be sure to include the account number and note designating for the Feeding program. Online giving is available also. 2 Cor8:3-4 "For they gave according to their means, as I can testify and beyond their means, of their own free will, begging us earnestly for the favor of taking part in the relief of the saints----"
Dominic writes "I heard over radio (BBC frequency) on how Pres. Obama is planning to change American healthcare. It may not be an easy venture. He has to convince the parliamentarians/senators on how the government is going to meet the huge cost. Most leaders in African countries had a great expectations from Obama but it seems he is losing popularity especially in his father's country, Kenya. Kenyans was expecting Obama to visit the country and may solve some economic burdens but that did not work. Some people still have hope for him to visit Kenya. South Sudan and people of Darfur have negative feeling about Obama's administration. The administration is very much compromising with the Khartoum Islamic government. The government is continuing in killing the people of Darfur and intimidating the people of South Sudan and opposition parties in the north but the Obama's administration is saying things are improving in Sudan. We hope someone may advise him that he is playing with snakes. North and South Sudan governments had a dispute on border demarcation in the oil rich Abyei region (the border between northern and southern Sudan). Each party wanted to control the available oil fields in the area As a result, there was lots of tension and even last year the two armies clashed in the area. The case was taken to court. Yesterday, the court of arbitration in Hague declared the findings of the demarcation of the border of 1905 and 1956 that the two major oil fields were to belong to the north (Arabs). The two sides accepted the results. In fact there was lots of tension in the whole Sudan for the last two weeks. Since Monday this week, Arab shops in the South were all closed. The owners feared that there was going to be conflict in Abyei which would spread to other towns in northern and southern Sudan. This morning friends in Torit, where I live, report that things have returned to normal and people have gone to work. We pray that God will continue to give peace in the hearts of war mongers." Women of Hope Mission (WHOM) projects of posho-mill and ox-plow kicked off in late 2007 and 2008. These projects are supported by ECSS friends at Trinity Baptist Church, Nashua, NH USA. The beneficiaries of the projects are very much excited and are grateful to God for His provision. The project of the grinding mill is located in Loming village where Jordan Anguramoi is pastor and the one of ox-plow is in Ilieu village, which has the most established congregation. Trinity Baptist made it possible for the purchase 6 bulls and plows. Before this, the widows were using hand garden tools for growing their millet, ground nuts (peanuts), and sorghum. Having the ox-plow project, this provided the widows with a more sustainable harvest and income and improve their livelihood. The most vulnerable were the elderly, widows and orphans which made up a very large part of the village population. In Ilieu, out of over 500 homes there are about equal number of widows living there. Most of the adult men were killed during the civil war. This project was the beginning of the feeling of hope for the future, where the people were so downtrodden before. The Women's Grinding Mill project will serve as a local resource providing assistance to widows and credit assistance to over 40.000 widows in seven villages. WHOM members, especially widows, have very low income potential. Most income generating projects are inaccessible to women both in urban and rural areas. Many of their families' basic needs, such as food, shelter, clothes. let alone medical care, school fees and materials, are not accessible to them. Severe malnutrition in these families is often prevalent among children. Too often, because of lack of resources, mothers unable to diversify their children's diets with vegetables and other vitamin-rich foods. Without a well-balanced diet, the risk of vitamin deficiency among young children rapidly increases. Women in Sudan work extremely hard, often much harder than their male counterparts. In Sudan, it is the traditional distinction between women's work and men's work that continues to place upon women's back many of the household duties such as cooking, fetching water, caring for children, cultivating and harvesting fields, pounding grain into flour, etc. One of the major tasks identified by women as the most difficult and time consuming is the pounding of grain into flour. This is a task that women undertake in preparing food for their own families. The goal is to lighten the manual tasks of women in food preparation, and to provide an opportunity for increased income generation, thus raising women's ability to care for their families and improve their children's nutritional status. Our initial objective are: 1) to provide one grinding mill each to two women's groups (congregations) in two rural areas of Sudan; 2) to assist women in increasing their household income through the establishment of rural savings and loan projects that will work from the revenue of the mill and provide small credit opportunities to women; 3) to facilitate the work of women in preparing food, and to provide additional free time for other care duties; 4) to improve the quality of food. However, we have seen that this will take time for us to realize these objectives because of the nature of the difficult situation in South Sudan. Importing materials from neighboring countries proved to be very expensive because of taxation and transportation. In September of 2007, one posho mill was purchased and transported to Sudan from Kenya. With the expert help from an government official, this posho mill was installed in the village of Loming and has been providing income for the local widows. Also Pastor Solomon Ollum, who is in charge of ECSS Immanuel church in Ilieu village is already getting support from the posho mill micro-income. The business of the posho mill is going on well although high price of fuel is becoming a problem. The ECSS Women of Hope (ECSS-WHOM) is still requesting all those good wishers to donate toward ox-plow project for widows in South Sudan. They need to begin the same project in other villages (Loming, Chalamini, Torit, Hiyala, Lobira and Lalanga). If interested, donations can be sent to the address in the Contact Information in this blog. A prayer meeting was held to give praise to God, for the 2 year anniversary of Dominic's major surgery to remove serious diseased kidney which was affecting his other good one. He had a kidney infection while attending NEGST and the medical doctor told him to ignore it. They lacked financial resources to get a second opinion. He was forced to receive good medical attention in late spring of 2006 when he was experiencing severe pain and later in October had the bad kidney removed. At the same time, he was in hospital, Rejoice delivered by cesarean their 4 child, a girl named Donna, at another hospital in Nairobi. Rejoice was only in hospital one day after delivery to save costs and because she had to take care of Dominic's hospital costs. His hospital stay was longer than originally planned and the hospital was demanding the cost be paid up front before he would receive any medical care. UNBELIEVABLE! They were going to have him arrested for lack of payment! He received no food or medicines and was checked upon frequently to make sure he had not skipped out of hospital. So Rejoice, carrying a newborn baby, had to go around Nairobi asking for a loan to take care of the hospital cost. Later TBC reimbursed them for the cost. So they were celebrating God's goodness during this difficult time. His recovery was slow because he kept having to return to Sudan to take care of ECSS business. Many prayers were said for healing. November of 2008, he had just returned from Sudan when he got serious sick again and was hospitalized for another 5 days or so. However, this time he received excellent medical care and it was discovered that his only kidney was not affected. But he had a bacterial infection and this time he received good medication to minimize any future kidney infection. He takes it seriously because it is the only kidney which keeps him alive. He returns to Nairobi every 3 months now for medical checkups. God is so good! He thanks TBC for the many prayers for his health. 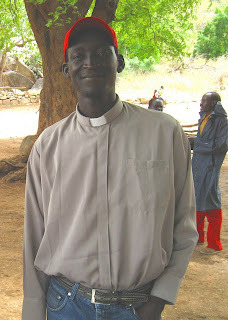 Let us introduce Jordan Anguramoi, ECSS pastor in Loming village in South Sudan. Family Background I come from the family who does not know God. My father was a polygamous person with three wives; my mother is a first wife. She had seven children, four died and we remain three, a sister who is married and a brother who is our last born. My father died in the year 1996. I have recently gotten married to Joyce who is with me while attending PACU. I have my own family with two adopted (orphan) grown up children. During my childhood, I spent most of my time herding my father's cattle and little attention was paid to my school because most schools were closed during the civil war. I struggled by myself until I finished my secondary school and later I attended an advanced diploma course of South Africa (Timothy Training Institute). I started my education in early age (compared to Sudan situation) when we took refuge in Uganda. Thereafter I cam back as returnees. I struggled to join secondary school in Sudan run by the Roman Catholic Church. I joined school and studied up to third year(high school) and sat for Sudan school certificate. I am determined to study at Pan African Christian University (PACU), so that I can be more effective in my ministry. I learned about PACU from the Rejoice, and thankful for scholarship support from Trinity Baptist Church and several other generous families. I hope I will grow more and more in Christian faith as I study at PACU. In June 1999, I attended a preaching of ECSS leaders at a deferral ceremony in Torit town. I came to know Jesus Christ to be my personal savior when I was finishing my secondary school (senior). This was the time when I started to read the Bible regularly. Through reading the Bible, I discovered that there was a very big difference between being a pagan and a Christian and I continued to serve the Lord and His people. I believe that Jesus Christ is perfect and sinless who paid my ransom by dying on the cross for us. I received Jesus Christ in my life and continue to make him known through our ministry of Evangelical Church of South Sudan (ECSS). My present ministry is the Evangelical Church of South Sudan, which is an indigenous, a Baptist church by practice and procedures. I am currently a youth and mission leader of ECSS and pastor of ECSS Church of Light (Loming congregation) "Lopa" County. My village is located on the top of a mountain, not far from the Ilieu village congregation. During rainy times, the road to my village remains impassable. Currently I am in a theological school enrolling my BA degree in theology at Pan Africa Christian University in Nairobi, Kenya; God willing, right away after graduation, I will be going back to Sudan to men and women of God in the ECSS. Jordan just finished his 2nd year of studies at Pan African Christian University in Nairobi, Kenya. He was married only one week before he was to leave to enroll at PACU in Nairobi and his wife, Joyce, joined him several months later. He has done very well in school even though he has not had much schooling before, as most Sudanese. But Dominic has been mentoring him and given him the responsibility of many arrangements for the pastoral training sessions in Sudan. During vacations from school, Jordan has returned to his village in Sudan, encouraging the congregations and being involved the Pastoral Training seminars and several outreach ventures. He promises to become an important pastor in ECSS because he and his wife has the sincere commitment to return to South Sudan to minister in their rural community. ECSS needs trained pastors to lead and manage the congregations to accomplish their mission and purpose. If pastors get trained we expect that ECSS pastors will work more effectively, able to work in team ministry and manage conflict in congregational life. There is an urgent need to provide financial support for the pastors. Congregations are unable to support their pastors. Some are forced to get government jobs in order to support their families, leaving the congregation confused and easily turn back to the world or traditional religions. Only the committed pastors still lead the congregations at a big sacrifice. ECSS held a pastoral training last April. Two pastors/trainers from Kenya joined us. The training went very well, thank you. We think that training and equipping local Church leaders and evangelists prepares ECSS Churches for a long-term growth and provides a solid base of significant Church outreach in the future. We are planning to train evangelists, and Church leaders in evangelism, pastoral work, entrepreneurship and the methodology of Church planting. We also plan to hold various youth camps, conferences and seminars in different parts of Eastern Equatoria State, South Sudan. We need your prayer and participation in this crucial project! ECSS is seeing a large number of people come to Christ but not enough are trained to teach or disciple the new believers. Christian believers can be led into false doctrines. They need to have a greater impact on society. The church wants to get the best from those whose call is to preserve the Word and those whose call is to get the Word out. 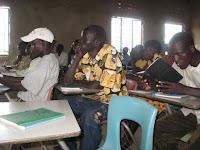 Your support can help ECSS to train more pastors. In reality ECSS lacks trained pastors who are grounded in the Holy Scriptures, rooted in the Word, and able to apply the Word of God to the lives of people for their salvation and for their own, to the glory of God. Pastors will be able to teach and preach the truth of the faith in Christ with clarity and precision. They will be able to prepare to lead in worship centered in Word. ECSS lacks trained pastors who communicate effectively, reaching the heart and mind with the Word. Therefore ECSS needs support for training its pastors who will be competent preachers and teachers of the Gospel. Those pastors who will be trained from theological colleges need to be ready academically and have Biblical knowledge and understanding through prayers and a broad educational preparation. ECSS needs trained pastors who are competent leaders in pastoral ministry. They will be able to integrate strong theology and pastoral practice. With a deep faith in God, a compassionate heart for people, and a gentle and peace loving spirit they are to serve the flocks and the lost by applying the Word of God to people they lead. ECSS seeks for trained men and women whose faith is centered in Jesus Christ and is nourished regularly by the Word in public worship and by a disciplined devotional life both in and out. ECSS looks forward to its pastors to know the Holy Scriptures well, to be confidently Church leaders, and to apply the Word of God to contemporary contexts and culture. If trained, ECSS pastors will understand the culture and where it is headed, engaging societal issues theologically. These pastors will be prepared to give a defence to the truths of the Christian faith against competing spiritual claims and movements of world religions and secular beliefs. They will be sensitive to their culture and able effectively to serve peoples with a vast diversity of origins, education, family customs, social structures, and political values. New believers expect pastors to encourage them, counsel them, mentor them, and teach them to live meaningful lives of service. Those who went to school need to explore their faith theologically to reflect on their service to church. They are in the mission field daily, and they to relate their faith to their daily service in family, church, work, and world. But due to lack of trained pastors, these sometimes do not work. ECSS needs trained pastors to lead and manage the congregations to accomplish their mission and purpose. If pastors get trained we expect that ECSS pastors will work more effectively, able to work in team ministry and manage conflict in congregational life. They will be able to prepare, manage themselves personally, spiritually, and emotionally and be ready for the daily routines of the pastoral ministry. Working hand in hand with members who have skills and gifted in various areas, so that the congregations can be able to carry out their primary mission of saving souls. ECSS as a Church needs pastors to serve communities who do not have regular pastors. There is a growing demand for different approaches to pastoral work that offer adaptability, portability, and accessibility within our congregations in Southern Sudan. 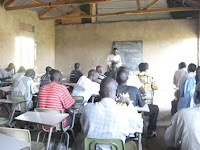 Your support can help ECSS to fulfill its dream by training its pastors. Starting the Southern Sudanese's education system after years of war is an emergency. The Evangelical Church of South Sudan (ECSS) thinks that supporting education is one of the best ways to address the issue of Islamization of the country, accumulated illiteracy, war orphans, inter and intra tribal conflicts, poverty, cattle raiding and AIDS. As the social infrastructure of Southern Sudan continues to disintegrate it remains insufficient to meet the basic needs of communities. Evangelical Church of South Sudan (ECSS) works to strengthen the country's education system through its ECSS Rural and Urban Development Outreach (ERUDO) ministry. Southern Sudan's education system has been shattered by years of harsh economic difficulties and the devastation caused by the 45 year old war. The condition of under trees learning system has deteriorated to such an extent that they do not provide a safe learning and teaching environment specially during rain period. In addition, there is a severe shortage of school supplies, classroom furniture and textbooks. To make it worse, volunteered teachers lack salaries and have inadequate training. Basically, providing access to quality education for war-affected children and youth is a key focus area in ECSS's ERUDO ministry in Eastern Equatoria State, Southern Sudan. 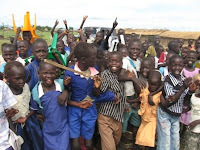 The ERUDO ministry focuses on strengthening and supporting the Southern Sudan's educational system by instilling Christian values to the children, parents/guardians and volunteered teachers. ECSS believes that education is the basic right of every child and the key to a brighter future for all children and youth, especially the orphans who constitute 40% of the three elementary schools ECSS is running. 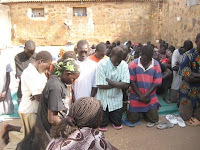 A weekly Bible Study was started in Torit prison, the first of its kind. During the first visit, 10 prisoners gave their lives to Jesus Christ. Prisoners ask for some Bibles and the Juba Arabic hymnals, each cost about $2.50. The hymnals are available in Torit but the Juba Arabic Bibles are out of stock at that time. They have the Otuho New Testaments Bibles. Trinity Baptist sent some funds to purchase the hymnals for the Prison and Hospital ministries and some for the Sunday services. Forty Arabic/English humnal books at $2.50 each, were bought. Twenty books were given for the prison ministry and 20 to the ECSS congregation in Torit. More hymnals books are need for the other congegations and also Bibles in Otuho, Arabic and English. The prisoners love to sing and praise God as they continue to meet for the weekly Bible Studies. April 2008 - First Mission Team from TBC visits ECSS in South Sudan On April 1, 2008, Joel and Rebecca Martin with John and Donna Shekleton arrive in Nairobi, Kenya to do basic hygiene instruction with HIV/AIDS prevention in rural communities of Kenya and South Sudan. After serving a week at the Malooi AIC Church and Pastor Kioko Mwangangi's rural home, the team arrived in South Sudan. There they met with Dominic and Rejoice Olluru and Jordan Anguramoi, who is TBC's scholarship student at Pan African Christian College in Nairobi. Since 1988, Dominic and Rejoice have started about 8 rural village churches and now he oversees the leadership as well as other projects, such as the ox plow project and the posho corn grinding mill. While in South Sudan for 10 days, the team cond ucted the hygiene and HIV/AIDS prevention instruction, simple VBS and painting the timbers of a church in 3 different rural congregations. They participated in the dedication of a new constructed church at Ilieu village, which is Dominic's childhood home. The church members were encouraged in the daily challenges of everyday living. On July 26, 2008, Rejoice Olluru graduates from Pan Africa Christian College receiving a BS degree in Christian counseling. She first enrolled in 2005. (insert Picture here) August 2008, Dominic's vehicle is repaired in Sudan, thanks to TBC "The car is on road, the car was repaired by a Kenya mechanic. I suggest that we will be making some minimum charges for our visitors who are going to use the car. This is because we do not have any budget/income allocated for maintaining the care. We need to buy engine oil, diesel, air filters etc on regular basis. We will be able to charge a minimum fee of $50 a day and future users will fuel the vehicle by themselves. When the vehicle travels outside of Torit, additional charges will be charged." Joyce, Jordan's wife, enrolls in a 3 year tailoring course at Ricardo's Tailoring and Embroider School. Since she does not speak English, she also enrolled in an English course. Joyce did not go to school (like many other Sudanese) so her teacher says that Joyce is good in practical skills but when it comes to measurements, number and other theories she is lost completely. Late in August 2008, TBC sponsored the Kenya Mission Team from the Malooi AIC church in rural Kenya, headed by Pastor Kioko Mwangangi, with 5 young fellows. They traveled to South Sudan to start a Tree Planting project in Torit by first building a nursery and then planting seeds. They had begun a successful Tree Planting project at their own church in Kenya which generated income to support some church ministries and local widows. Their purpose in Southern Sudan was to plant trees to improve the environment and nutrition. They planted 14 varieties of tropical fruit trees, as well as hardwood trees for timber. Some of these trees will be planted along the boundaries of Dominic's property. These fruit trees should mature in about 5 years, ready for consumption. The team gave instruction about the care of the seedlings and trees and the seedlings continue to grow in the following months. Several months later the trees were transplanted all over on Dominic's property. More seeds were planted and cared for. In the late 1980's, young Sudanese men and women from the Southern Sudan, fleeing the constant fighting and persecution of the war in Sudan, began to arrive in Kenya. Some of these Sudanese settled in the Dadaf refugee camp, others in the outskirts of the town of Thika, and still others in Nairobi. Some of these refugees became Christians. Instead of seeking resettlement overseasor in neighboring countries, these Christians determined to go back to war-ravaged South Sudan in order to share the Word of God with those who had remained behind. 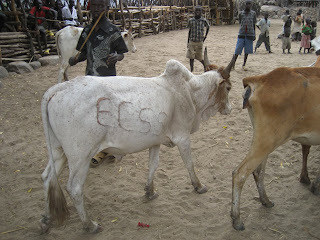 The first Evangelical Church of South Sudan (ECSS) congregation was formed early in 1998 in Torit County, which is in Eastern Equatoria State. The membership decided that it would be preferable to be called ECSS which would more correctly reflect their desire to be a non-denominational church both in their nature as well as in their approach. This grew out of a desire to avoid what has happened to other churches in South Sudan, as well as in the rest of the world. That is, that the churches had become divided into denominational lines. It was felt that by dividing along denominational lines, Islam and African traditional religions would likewise continue to gain ground. The memborship felt strongly that South Sudan needed a united Church which could face the expansion of Islam from the northern part of the country to the south. ECSS is a non-denominational, indigenous, evangelical church committed to the Protestant Reformation. For the last 10 years of its existence, ECSS has held the privileged position of being the established church in its area. ECSS seeks to initiate, maintain, and strengthen its relationships with and engage in mission work alongside of other evangelical Christain churches, denominations, missions, and ecumenical agencies for the common mission of our Lord Jesus Christ. At present, the ECSS has 6 congregations in Southern Sudan, all in the Eastern Equatoria State, which borders Kenya and Uganda. Currently, the church has over 3,500 registered full members with their ministers. The ECSS has a mission vision of reaching the unreached in all parts of Southern Sudan as well as into the surrounding nations beyond the borders of Sudan. As we have only been in operation for some 10 years, our initial ministry focus or concentration has been among the Otuho people group in eastern Equatoria State. Nevertheless, we are also currently working with other ethnic groups including the Boys, Didinga, Lang'o, Lopit, Pari and Acholi people groups in Easter Equatoria State. 1. We believe the scriptures, both Old and New Testaments, to be the inspired Word of God, without error in the original writings, the complete revelation of His will. For the salvation of men, and the Divine and final authority for all Christian faith and life. 2. We believe in one God, Creator of all things, infinitely perfect and eternally existing in three persons, Father, Son, and Holy Spirit. 3. We believe that Jesus Christ is true God and true man, having been conceived of the Holy Ghost and born of the Virgin Mary. He died on the cross as a sacrifice for our sins according to the Scriptures. Further, He rose bodily from the dead, ascended into heaven, where, at the right hand of the majesty on High, He now is our High Priest and Advocate. 4. We believe that the ministry of the Holy Spirit is to glorify the Lord Jesus Christ and during this age to convict men, regenerate the believing sinner, and indwell, guide, instruct, and empower the believer for godly living and service. 5. We believe that man was created in the image of God but fell into sin and is therefore lost and only through regeneration by the Holy Spirit can salvation and spiritual life be obtained. 6. We believe that the shed blood of Jesus Christ and His resurrection provide the only ground for justification and salvation for all who believe, and only such as receive Jesus Christ are born of the Holy Spirit, and thus become children of God. 7. We believe that water baptism by immersion and the Lord's supper are ordinances to be observed by the church during the present age. They are, however, not to be regarded as means of salvation. 8. We believe that the true Church is composed of all such persons who through saving faith in Jesus Christ have been regenerated by the Holy Spirit and are united together in the body of Christ which He is the Head. 9. We believe that only those who are thus members of the true Church shall be eligible for membership in the local church. 10. We believe that Jesus Christ is the Lord and Head of the Church, and that every local church has the right under Christ to decide and govern its own affairs. 11. We believe that in the personal and premillennial and imminent coming of our Lord Jesus Christ and that this blessed Hope has a vital bearing on the personal life and service of the believer. 12. We believe in the bodily resurrection of the dead; of the believer to everlasting blessedness and joy with the Lord, of the unbeliever to judgment and everlasting conscious punishment.